The Zodiac Pig is made from a orange-peach coloured material with a shiny red snout and shiny gold trotters. He has blue and black button eyes and the inside of his ears are shiny red. The snake is your enemy! The Zodiac Pig was released on 19th August 2000. 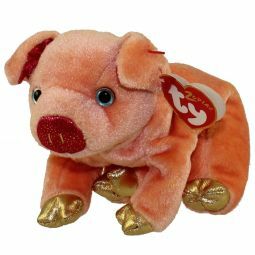 He is part of the Zodiac collection of Beanie Babies which included a Pig, Goat, Horse, Monkey, Ox, Dragon, Rabbit, Dog, Rat, Rooster, Snake and Tiger. He was retired on 11th May 2001.